MB&G can train your staff to maximize the power – and return – of your GIS software and devices. MB&G‘s team has strong technical skills, a deep understanding of business needs, and the ability to effectively communicate with stakeholders at every skill level. We work with clients of varying skill level and disciplines including GIS, GPS, remote sensing, forestry, and other natural resource fields. Training should be tailored to the unique needs of your business, and address both non-technical personnel and professional experts. Our goal is to empower your workforce with geospatial technology that can improve efficiency and present data in a more useful and powerful manner. 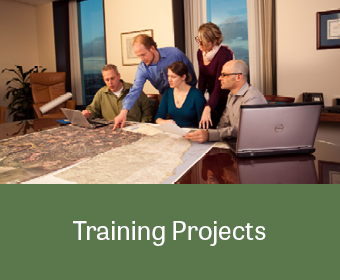 We love what we do and are passionate about sharing our GIS knowledge with others. We design custom training package to meet your specific needs. We talk with your people and assess the most urgent needs for your training and then provide on-site or in-house training, or both. After the training, we continue technical support to leverage your investment and ensure that folks are comfortable with the new technology.